More than 60,000 people have fled the months-long offensive by pro-Assad forces to recapture a strategic airbase and re-enter opposition-held Idlib Province in northwest Syria. Defying a supposed “de-escalation zone” proclaimed by Russia, Turkey, and Iran this autumn, Assad regimes and Iran-backed foreign militias — joined by Russian forces who are supposed to be overseeing a ceasefire —- have seized territory in neighboring northern Hama Province and closed on the Abu Duhur airbase in Idlib, while taking a series of villages in the southeast of the province. The UN Office for the Coordination of Humanitarian Affairs said tens of thousands of civilians had left their homes since November 1. Almost all of Idlib Province was taken by rebels in spring 2015, raising the possibility of a collapse of the Assad regime and its military. Russian intervention, with thousands of airstrikes and accompanying the ground operations of Iran and the foreign militias, propped up the regime and has since eroded the opposition position in the northwest of the country. The pro-Assad forces are justifying their assault by arguing that it is against the hardline Islamist bloc of Hayat Tahrir al-Sham, which is the leading military presence in Idlib. HTS includes Jabhat Fatah al-Sham, formerly known as Jabhat al-Nusra and linked to Al Qa’eda until July 2016. The displacement will double, it will multiply….Most of them are sleeping on the ground, in tents that can’t protect from the rain or the cold. Some people are able to rent, but the rent prices have also been very high. 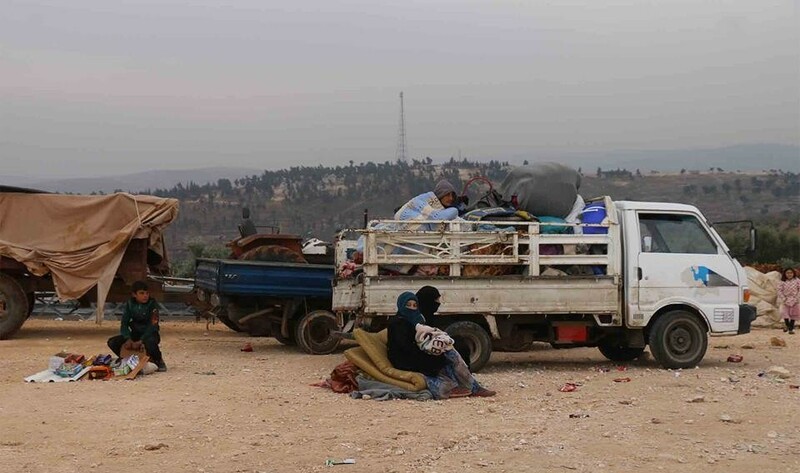 OCHA spokesman Jens Laerke said 55% of communities in Idlib are overburdened, with displaced persons making up more than 70% of the total population in 10% of them.